Here’s Why You Oughta Make a Date with Dates! Do you like dates? I wasn't that crazy about them until I started looking for healthier ways to get my "sweet fix." Since then, I've come to really appreciate and savor this beautiful fruit. 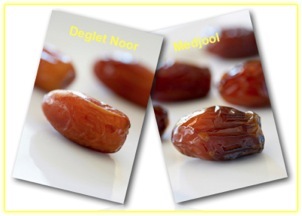 But one of the things that I wondered about was the difference(s) between Deglet Noor and Medjool dates. I thought it would be good to talk about them since right now is date season and the time to get the freshest of the fresh. The Date Research Institute (who knew?) explains it this way: "Of all the many varieties of dates available worldwide, there are two varieties which are the most commercially produced within the United States (mostly California): the Deglet Noor and the Medjool. They each have unique characteristics and usages. "They are one of the healthiest fruits, have distinct and pleasant flavors, and are considered a very nutrient-dense food. 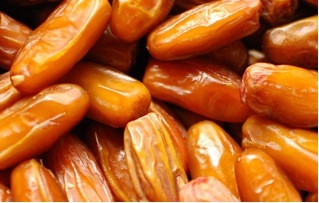 Dates are loaded with antioxidants, potassium, manganese, and fiber, and are sodium-, cholesterol- and fat-free. "Deglet Noor: It's smaller in size, compared to a Medjool. These dates have a special advantage-they can be machine as well as hand pitted. So this makes them particularly suited for chopping, sugaring, pureeing into concentrate, or useing in paste. Deglets have a lighter, golden amber brown coloring. This is the date commonly used in 'date sugar,' an excellent refined sugar substitute. "Medjool: The Medjool variety is one of the largest dates; they are graded in size from large to king. Medjools are a deep brown color and possess a sweet caramel flavor. You'll always find them with pits because the fruit is too soft to put in a mechanical pitter. However, the pit can be removed without difficulty by making a small, lengthwise slice into the date, and simply pulling it out. Folks enjoy the Medjool variety for their versatile use as stuffed appetizers." I was first introduced to the idea of stuffing dates in the bulk foods section of our Good Earth Natural Foods store. It was the morning of New Years Eve and a lady was bagging up what seemed like a massive amount of Medjool dates. I asked her what she was planning to do with them. She looked at me like I was from another planet and said, "We always stuffed these with cream cheese-they're one of the most popular attractions at our annual New Years Eve party. Have you never had a date stuffed with cream cheese?" I was embarrassed but honest and admitted I hadn't. But you can bet I bought some and tried the idea out that very day. Holy cow that's a good flavor combination! 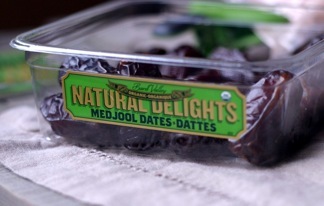 And by the way, Medjool dates are also the preferred date for cooking and baking, and are typically the date you'll find in gift baskets along with nuts and chocolate. Finally, the last difference between the two varieties is in serving size. 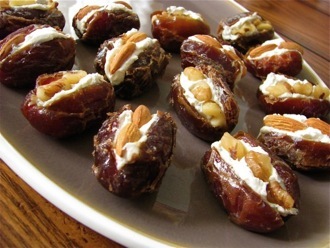 The recommended serving size for dates ranges from 2-6 dates (40 grams) for a total of a 120-calorie serving. For the medium-sized Deglet Noor dates, one serving is equivalent to 6 dates that are 20 calories each. However, when consuming the large Medjool dates, a serving is 4 dates of 30 calories each. Now that I've become date-savvy, I designate each variety to specific jobs. Chopping calls for Deglet Noors (I add them to my granola and muffin recipes). But the Medjool is my favorite and the one I use most often. I stuff them ("Thank you, lady in the bulk food dept. of Good Earth! "), eat them plain, and love love love to mash them and roll them with almond butter, dried cranberries, and unsweetened coconut. So I'll conclude with my favorite reason for making a date with dates: They are a terrific substitute for traditional not-good-for-you sweets. Got a sweet tooth with a recurring craving? 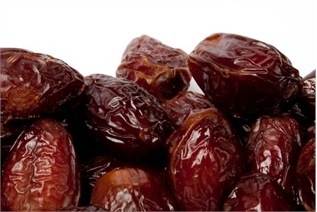 Make a date with dates-they're good for you and they satisfy!